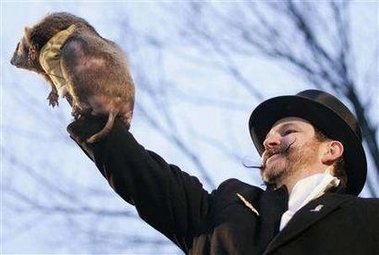 So some rodent named Phil doesn’t see his shadow (nice ‘stache, btw) and, voila, it’s instantly spring around here. I’m surprised the Bush administration hasn’t blamed Phil and his kind for global warming and declared war on groundhogs. Regardless of our impending demise, folks around these parts seem to be enjoying it. With all the shorts and tank top being sported, you’d think it was summer and not in the high 40s. It even inspired me to tick the year’s first 5.12, complete my first ridge traverse, take my first road ride, and wash the salt off of my car (that’s right, it’s black). Alas, there is snow in the forecast. So I’d better wrap it up and get out there while I can.